Here is an interesting name for an adware program. It is called Ninja Savings and it has nothing to with ninjas or savings, because it is a mere adware program that you might want to remove from your computer. This program’s developers try to trick inexperienced users into thinking that it will save them thousands of dollars a year by showing them various deals and supposedly great offers. None of this is actually true, as this application should display commercial advertisements irrespective of the price found on other online shopping websites. We say that it “should” because it has not been released yet. So we can only speculate about what this application can do and what dangers it poses based on encounters with previously released applications that we refer to as this program’s clones. Ninja Savings is promoted on a dedicated website called Ninjasavings.com. This cheaply-made website contains unsubstantiated claims about how great this program is, but we are here to debunk such claims. So this application is not yet released, but it is already advertised on its website and it even has a download button, which fortunately does not work. However, once Ninja Savings hits the web, it will not only be featured on the aforementioned website, but we will also find it bundled with other programs. Our best guess is that it will be bundled with legitimate freeware and put up for download on websites such as Software.informer.com. This application is almost identical to previously released adware called PriceChomper, DealBarium, and Price Slicer. These applications should also be removed; since they too try to trick people into thinking that they are in some way beneficial and will help them save money. The fact of the matter is that Ninja Savings will not help you save money, but make money for its developers and whoever purchases their advertising services. This program’s End User License Agreement states that Ninja Savings will display several basic types of advertising, including sponsored links, banners, pop-unders, interstitial ads, coupons, video ads, and in-texts. So the list of advertising methods is quite extensive. This program’s promotional campaign indicates that it will choose and show you the best deals from more than one thousand online shopping websites, but we are absolutely certain that this program’s developers did not make any arrangements with any online retails. It might show ads that redirect to a legitimate retailer’s website, but it will not redirect to the specific page of a product that you saw on the ad itself. Like most adware applications, this one also collects information to customize and personalize the ads, but from previous encounters with its clones we can say that that is not going to happen. It will display random ads regardless of your search history, which includes search queries and viewed ads. There is not a single adware application that would deliver legitimate and relevant content that you might be interested in. All adware is bad and is apt to promote unreliable content, because it is widely used by shady entities to advance a certain agenda. If you want to be on the safe side, then we suggest that you remove Ninja Savings if you get it, because its ads are annoying, irrelevant, and unreliable. Like its counterparts, it should be uninstalled via the Control Panel, so we have included a removal guide. 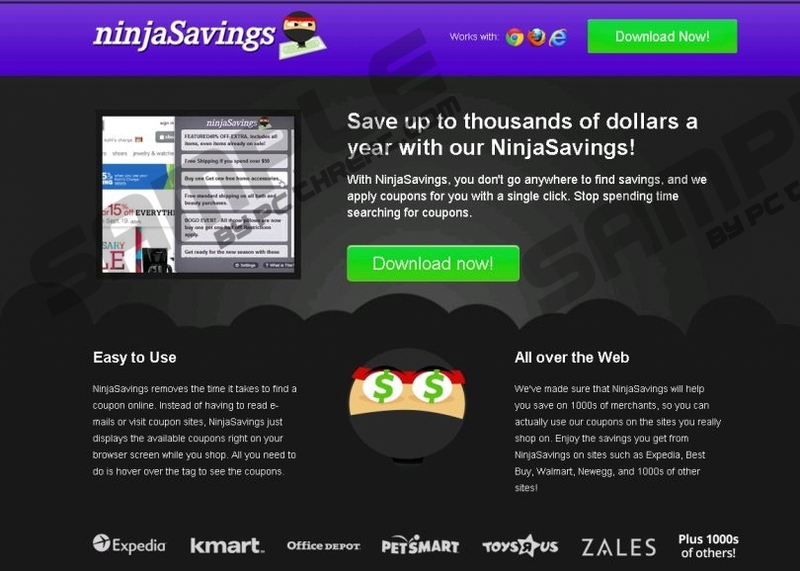 Find Ninja Savings and click Uninstall. Move the mouse cursor to the lower left corner of the screen and click the Start screen icon. Find Ninja Savings, double-click on it, and Uninstall it. Quick & tested solution for Ninja Savings removal.